Bone tumors are classified according to histological characteristics. The cell structure and the additional characteristics of the tumor tissue are taken into account in the nomenclature (Tab. 18.1). From a clinical point of view (disease staging), it is not always easy to differentiate between benign and malignant forms because tumors can display very different growth patterns. Metastases from tumors (Fig. 18.1) are very frequent secondary forms of tumor and must always be considered in a differential diagnosis, especially of ostalgia, as must the tumors of the hematopoietic system (lymphoma, leukemia, multiple myeloma). FIBROSARCOMA AND LIPOSARCOMA: Extremely rare. They are similar to those tumors arising in soft tissue. Fibrosarcoma is a rare tumor that affects men in particular and may occur as a primary or secondary lesion after radiation or due to Paget disease. The clinical and radiologic picture of this tumor, which mainly affects the long bones, is similar to that of osteosarcoma and can only be differentiated from it by histologic examination. OSTEOSARCOMA: Osteosarcoma is the most frequent malignant bone tumor and can occur at any skeletal location with a predilection for the metaphyses of the long bones. Osteosarcoma may occur as a primary or secondary lesion, e. g., in the context of Paget disease or after radiation. Rapidly increasing pain, local tumorous swelling, and increased AP levels are often the first clinical signs. The radiological picture may vary depending on growth. The osseous structures are indistinctly delineated with periosteal reaction as a sign of aggressiveness. CHONDROSARCOMA: Chondrosarcoma is the second most frequent tumor after osteosarcoma and is a malignant tumor primarily affecting the pelvis and shoulder girdle. In the region of the anterior chest wall (costochondral and sternum), chondrosarcoma is the most frequently occurring malignant tumor. As with other malignant tumors, metastasis is possible. In the early phase, it is often difficult to distinguish chondrosarcoma from benign chondroma. The lytic lesions tend to have poorly defined margins, extend into the soft tissues, and may present calcifications. Chondrosarcoma may occur as a primary or secondary tumor (malignant degeneration of osteochondroma, multiple exostosis, fibrous dysplasia, or after radiation). EWING’S SARCOMA: A malignant tumor of unknown histogenesis. MULTIPLE MYELOMA: A neoplastic proliferation of plasma cells. Fig. 18.1 Osteolytic metastasis with pathological fracture of the vertebral body L4 in the presence of breast carcinoma. The age of the patient and the initial radiographic features often determine the next appropriate diagnostic steps. • Classic osteogenic sarcoma penetrates the cortex early in many cases. 1. 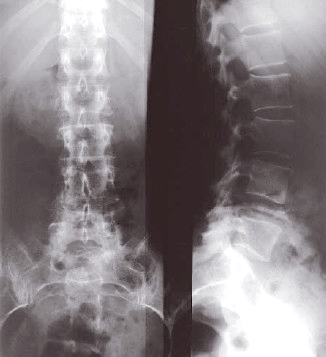 A blastic (dense), lytic (lucent), or mixed response may be seen in the affected bone. 2. An aggressive perpendicular sunburst pattern may be present as a result of periosteal reaction, and peripheral Codman’s triangles are often noted. 3. Margins of the tumor are poorly defined. • Speckled calcifications in a destructive radiolucent lesion are usually suggestive of chondrosarcoma. • Ewing’s sarcoma is characterized radiographically by mottled, irregular destructive changes with periosteal new bone formation. The latter may be multilayered, producing the typical “onion skin” appearance. • Typical roentgenographic finding in multiple myeloma is the “punched out” lesion with sharply demarcated edges. 1. Multiple lesions are usual. 2. Diffuse osteoporosis may be the only finding in many cases. 3. Pathologic fractures are common. The evaluation and treatment of malignant bone tumors are complicated. Diagnostic studies and treatment should be supervised by an orthopedic cancer specialist and oncologist. • In the past 20 years, dramatic improvements have been made in the treatment protocols for osteosarcoma with the use of adjuvant multidrug regimens and limb-sparing surgery. • Early diagnosis is important because most tumors have not metastasized at the time of the initial presentation. • 72% 5 - years survival rates have been obtained in some series. • Prognosis of multiple myeloma remains poor despite new therapies. 1. Complete remissions are uncommon. 2. Survival with a solitary lesion may be long, but most patients succumb after a median of 3 years. • Prognosis for Ewing’s sarcoma has improved with a combination of chemotherapy, local resection, and radiation therapy. • Chondrosarcomas are not sensitive to chemotherapy or radiation, and prognosis will depend on the grade of the tumor and the ability to obtain an adequate resection.